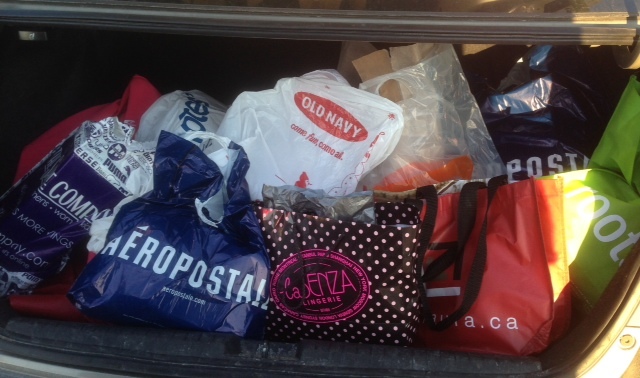 For my daughter Meghan’s 13th birthday, my sister and I took her out for a full day of shopping at an outlet mall near Toronto called Vaughn Mills. I’m not a “shopper”, so I had never been to Vaughn Mills and neither had Meghan. We truly had a blast!!! It was so fun to have no agenda, and just be together. Yet, something really bugged me about the day – Consumerism. I had set a personal budget for myself and Meghan for our shopping adventure. My awesome sister was getting Meghan’s Christmas and birthday presents, so how fun was that?? Yet, even with a budget, it was so easy for me to get sucked into the “must have deals”. (Literally, there were signs that said “Must Have Deals!” lol) I have just recently lost a bit of weight, so I justified my purchases with the need for new clothes. (Ok, well, my old pants were too big, so I really did need new jeans! ). And what 13 year old girl doesn’t enjoy a day out with her mom and aunt, trying on clothes, being silly eating, awesome meals, and just spending time together? It really was a perfect shopping day. And the deals we got were fantastic! Yet, there were SO MANY PEOPLE at the mall! I couldn’t believe it. I guess I live a sheltered life in my small town north of Toronto, where a line up at the grocery store of more than 5 people is considered busy. But what was everybody shopping for? How much money was actually spent at Vaughn Mills on Saturday, March 16th? Would all of the wealth spent that day be enough to feed all the hungry people in all of Ontario for a month? or maybe even longer? But maybe I’m exaggerating. Well, maybe not. Then I stopped myself from judging. I don’t know any of the personal stories of the shoppers. Maybe they were celebrating birthdays, shopping for grad dresses, filling a painful void with “retail therapy”, etc. I’m sure that some have given a portion of their earnings to charities or churches, to help the poor and lost. It’s not my place to judge or question what everyone was shopping for. Yet, what really got me was the way it was so easy to get swept up by all the deals. One deal lead to another, which lead to another, etc. Meghan and I had a great conversation about it on the way home. Even she had a moment of guilt about all the purchases. I definitely didn’t want her to feel bad about such a fun day. We discussed how we give to many different charities, and support our church. Plus, we don’t shop like this all the time (our favourite stores are the Thrift Store and Value Village ). Am I just trying to justify our purchases? Possibly. But it worked. So I’m taking away the wonderful memories of my beautiful daughters’ 13th birthday shopping day with smiles. THAT is what the day was about. Eventually, we’ll forget all the” things” we bought, but we’ll never forget the day we spent together. 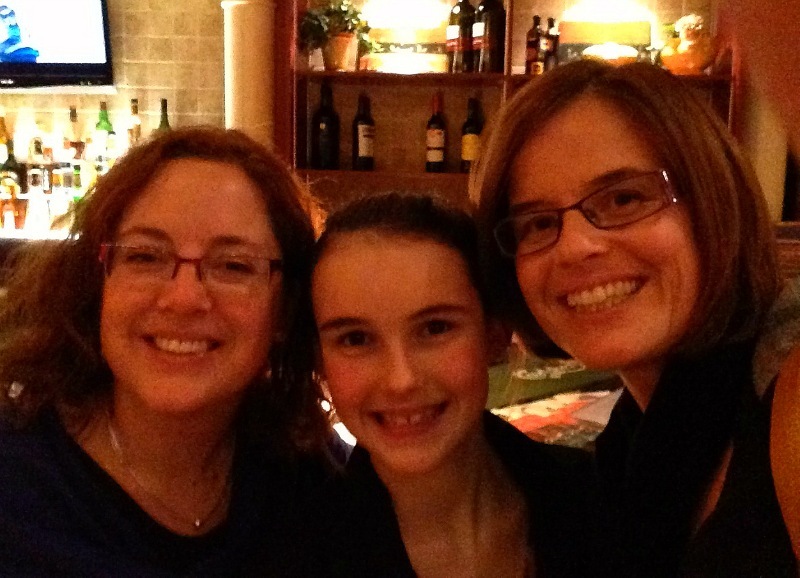 My awesome sister, Jacquie, with my beautiful daughter Meghan and me. Whoever loves money never has enough; whoever loves wealth is never satisfied with their income. This too is meaningless. As goods increase, so do those who consume them. And what benefit are they to the owners except to feast their eyes on them? Previous PostPrevious Set Yourself Free. Forgive. Next PostNext Life. Is. Fragile.